It’s difficult to think of my life as a garden. But that’s just what it is, isn’t it? A small patch of earth populated by new growth, the occasional stunning blossom, weeds, trampling of feet, the stench of manure, and all the rest that goes into the pot. It seems nature, aided and abetted by a Master Gardener, combines the good, the bad and the ugly within one spectacular display. Seen from afar the garden glimmers almost like a desert mirage. The photos above are from Chanticleer Garden. It’s a magical place. Even so, weather happens. People happen. Bird poop, poison ivy, weeds, and predatory mosquitoes happen. It takes a team of gardeners to keep up with pests, damage and overgrowth on the ground. As for my life, I’m at peace with my past. Still, I can’t dispense with a team of gardeners, much less the Master Gardener. There’s work yet to be done beyond my limited eyesight and capacities. Above all else, I want to keep the ability to see and appreciate small gifts sent via nature. Gifts that arrive unannounced, just when I need them. Like the photos in this post. Photos taken by DAFraser, July 2017, at Chanticleer Garden. And how can I help you today? I can proofread that if you’d like. It’s nothing. Really. Nothing at all. No problem. It won’t take long. It wasn’t being born female that scarred me. It was overtime, double duty hyper-vigilance plastered layer upon layer with each attempt to control, use or fix me. Over time petrified limbs of my body and soul cowered whether I wanted them to or not. I fell into protective behaviors that stifled every hint of unhappiness or, God forbid, revulsion. I was physically and emotionally exhausted. Each woman is different. Internal scars from child abuse, and sexual harassment or unjust workplace practices that disadvantage women are not the same as external scars or physical challenges. Sometimes the best way to begin healing is to find a trusted friend or referral service to suggest next steps that might work for you. I was initially helped by a twelve-step group of over 20 women meeting weekly in a church basement. It didn’t cost me anything but my pride plus $1 a week (optional) in the basket. For 5 years I showed up 2 or 3 times each week for this and other twelve-step meetings. All while I was teaching full-time at a seminary. It took me that long to realize I needed professional help. By then I was in my late 40s. I began blogging four years ago to break silence about my childhood and teenage years. Today it’s about more than that—though dealing with my past helped free me to write as I do today. When we women invest wisely in our emotional, spiritual and physical health, we do the most important work of our lives. We don’t deserve to carry heavy layers of scars. Some can be laid aside. Others we get to keep. They connect us to sisters and brothers, and can, from time to time, add to our beauty and wisdom. This morning small verses began popping into my mind. In fact, they haven’t stopped coming. So here’s #1 with brief comments about my hospital visit six days ago to get a pacemaker. Dear Mom, I miss you. I miss you. I’d love to sit down with a cup of tea and continue the conversations we had before your stroke. Though you didn’t particularly like all my questions about your past, you did your best to answer them. I’m grateful for every conversation we had back then. I’m also grateful that you wrote down memories of your early life. A bit of your personal history. Every now and then I find myself hungry for more, though most of the time it’s enough. Your written words give glimpses of your heart and your struggle with circumstances over which you had no control. I’ve been thinking about your memorial service in 1999. I got to make remarks on behalf of the four of us, your daughters. I decided to show and tell how much you loved teaching children music. Not just to the four of us, but to the kindergarten children you taught after I’d married and moved away. I still have your old spiral music notebook, filled with children’s songs. For your service I picked out several of my favorites and said a bit about each song before I played the music. I also read the words and demonstrated motions for at least one of the songs. The one about how elephants kalump along, their long noses swaying in time to the music! The most fun was coming to the end of “The Polliwog’s Story,” and (like you, without warning) suddenly turning around on the piano bench to give everyone a big scare with the last line! They loved it! For a moment we felt your joy and exuberance, and celebrated your lively spirit and your love for children and music. I also played some of your favorite adult hymns. Not too many, but just enough, with comments about why I chose each. The most difficult to get through was “Great Is Thy Faithfulness.” That was the hymn you tried to sing so often when you first got polio, even though your vocal chords were paralyzed. I’m tearing up as I write this part. I owe you so much. I’ve been reading a book by Henry Nouwen. He talks about the way absence can cause our love for someone to grow. I’m beginning to understand what he’s talking about. Part of it is my freedom to write you these letters and say things I couldn’t say while you were with us. It’s also because I understand our family dynamics more than before, and how costly they were for you, not just for me. A few days ago I was thinking about my grandparents and how little I knew any of them except for your father, my California Grandpa. That got me thinking about the way you and he related to each other, especially since your Mom wasn’t around for most of your life. When we lived on the West Coast, we spent lots of time visiting Grandpa and going with him to fun places like the Wilson Observatory and the Griffith Park Zoo. Even his apartment was fun! There were long sidewalks outside. I remember learning to ride my first bike on them. The bike he gave me, with training wheels. After we moved to the East Coast, things changed. But you still kept in regular touch through letters. I know you wrote to him about us and what we were up to, because his letters to you sometimes included comments back to each of us. He seemed to dote on us. It meant a lot to me back then to know he thought we were the best and the brightest little girls in the whole wide world. I’m guessing it meant a lot to you, too. You must have missed him terribly. I think you inherited your love of fun and of children from him. 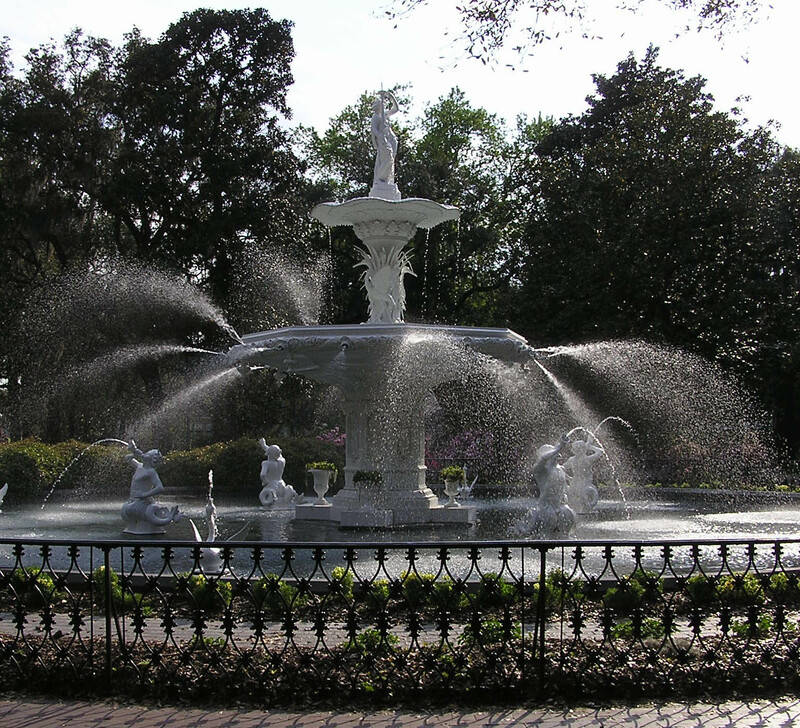 How do you like the photo of the Forsythe Park Fountain? I love the water droplets flying through the air! If you enlarge it, you’ll see pink azaleas blooming in the background.